People take batteries for granted, but they shouldn't. All kinds of technological advances hinge on developing smaller and more powerful mobile energy sources. Electrically small antennas (ESA) find use in a wide variety of communications platforms – e.g. mobile phones an other handheld devices, RFID, aerospace and defense systems – but their construction requires advances in printing as well as a robust antenna design so that their operating frequency, size, and system impedance could be easily varied. Electrically small antennas (ESA) find use in a wide variety of communications platforms - e.g. mobile phones an other handheld devices, RFID, aerospace and defense systems - but their construction requires advances in printing as well as a robust antenna design so that their operating frequency, size, and system impedance could be easily varied. A new ink developed by researchers at the University of Illinois allows them to write their own silver linings. May 2005 -- Our work in direct-write assembly of microfluidic channels was featured in the Royal Society of Chemistry's journal, Lab on a Chip (Volume 5, Number 6, June 2005). The article highlighted the innovative fabrication process of microfluidic channels using a fugitive inks. Air Force Research Laboratory's Technology Horizons cover article: Funded by the Air Force Office of Scientific Research, a team of scientists developed a technique to fabricate three-dimensional microvascular networks embedded in epoxy. These miniscule networks could have many uses as compact fluidic elements in sensors, chemical reactors, and computers. The French magazine Science & Vie highlighted our work (center right) as a nanoscience image of the year, in their 2004 year-in-review issue. 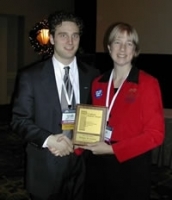 At the 2003 Fall MRS Meeting, Gregory Gratson received the Gold Award in the MRS Graduate Student Award competition for his presentation entitled "Bio-Inspired Polyelectrolyte Inks for Direct-Write Assembly of 3-D Micro-Periodic Structures". He was one of 15 selected for this prestigious award. L'Usine Nouvelle, May 27, 2004, Projet, "L'impression 3D Accélère La Production Des Microstructures"
Our work on directed assembly of 3-D periodic structures via robotic deposition of concentrated colloidal inks was recently selected as one of the top research developments in materials chemistry by Chemical & Engineering News' in their feature article entitled "Chemistry Highlights 2002" (December 16, 2002).